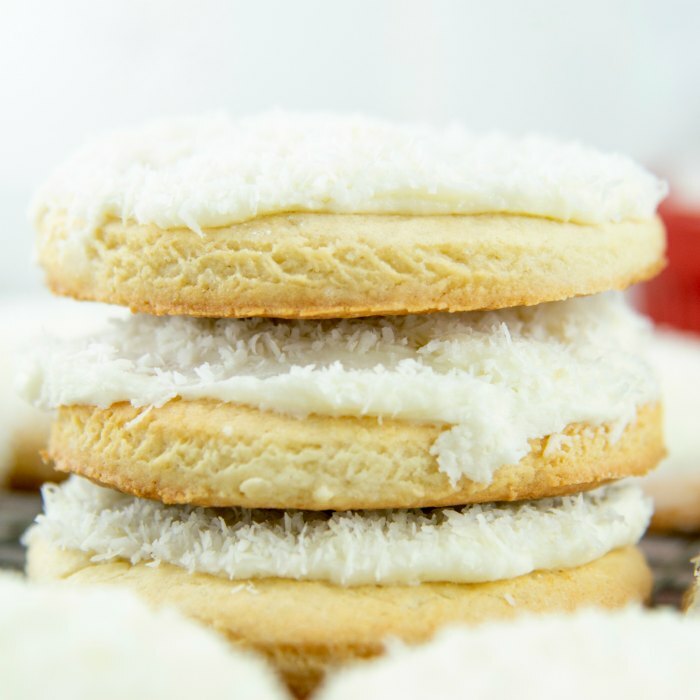 This Snowball Cookie Recipe bakes cookies that are crisp on the outside and soft on the inside, and with a hint of coconut added to the frosting, your senses might think you’ve been transported to a tropical beach. Oh how I long to be on a tropical beach!!! Step 2: Cream together shortening, sugar, egg and vanilla extract. Step 3: Sift together flour, salt and baking soda. Add mixture to wet ingredients, alternatively adding in Greek yogurt. Step 4: Flour surface and roll-out cookie dough. Use top of a jar or biscuit cutter to make round cookie shapes. Step 5: Bake 8 minutes. Transfer to cooling rack immediately. Step 6: In medium bowl, using mixer on low, mix powdered sugar, butter, milk and coconut extract until thoroughly combined. Beat on high until frosting is smooth and fluffy. Step 7: Spread frosting on cookies. Pour shredded coconut into small bowl. 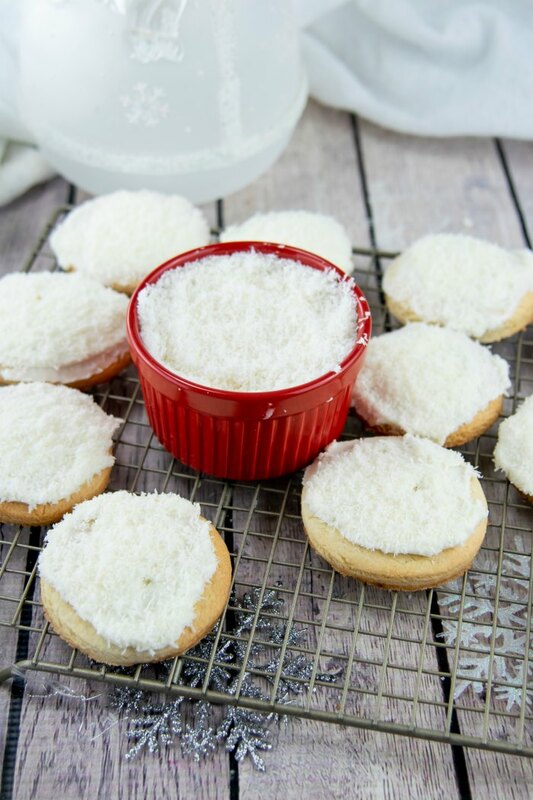 Press cookies, frosting side down, into shredded coconut. Step 8: Store in airtight container. And for those bakers who prefer a visual walk through, watch this tutorial on how to make this snowball cookie recipe. A special thanks for this snowball cookie recipe from www.culinary.net. 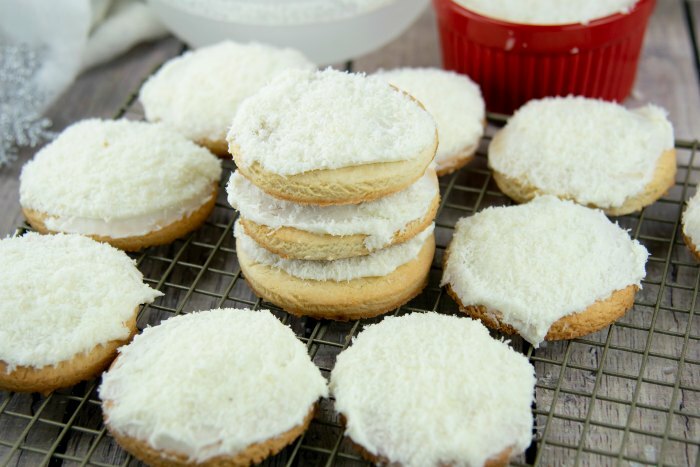 This Snowball Cookie Recipe bakes cookies that are crisp on the outside and soft on the inside, with a hint of coconut added to the frosting. Flour surface and roll-out cookie dough. Use top of a jar or biscuit cutter to make round cookie shapes. Bake 8 minutes. Transfer to cooling rack immediately.In medium bowl, using mixer on low, mix powdered sugar, butter, milk and coconut extract until thoroughly combined. Beat on high until frosting is smooth and fluffy. 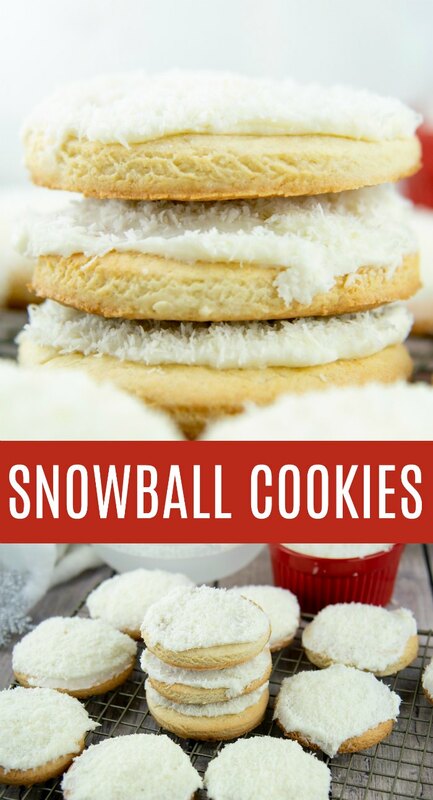 We will love your Snowball Cookies! Hope you have a very special holiday and thanks so much for sharing with us at Full Plate Thursday.